Part 1 of the GO series photographed three different active GO construction sites for Hamilton. For readers not aware, see GO Part 1: Major GO Train Construction for Hamilton. This second article of the GO series shows an easy way to potentially bring all-day weekend GO train service to Hamilton in the very near future, at potentially no extra taxpayer dime. It will require CN, City of Hamilton, Metrolinx, and LIUNA Station, to efficiently co-ordinate work that is already funded. By having this existing train stop at West Harbour, Hamilton immediately gains all-day two-way summer weekend and holiday GO train service to/from both Toronto and Niagara Falls! Of 16 trains in one weekend, there are eight trains Toronto-to-Niagara and eight trains Niagara-to-Toronto. Even St. Catharines got all-day two-way summer weekend service. Why don't these Niagara trains stop in Hamilton already? A portion of the still-under-construction West Harbour GO station was partially opened on time for Pan Am games. More is covered in the GO series Part 1. Construction Phase two of West Harbour GO will take until 2017 (this date was known as early as 2012). This includes extension of the spur track to reconnect to the CN main line. This is already fully funded in the current secondary phase of the West Harbour GO construction. It will turn West Harbour into a through-station, making it easy for Niagara GO trains to do a Hamilton stop. One possible solution is a 100 meter railroad track extension. This allows West Harbour GO station into a pass-through station, using the shortest possible amount of trackage. All Hamilton needs in order to get all-day summer weekend GO train service. Or is it? There are many variants of this possible solution. For example, the switch may be built further east (instead of between James Street North and John Street North). The actual Metrolinx professionally-vetted solution may be very different from the solutions suggested in this analysis article. However, this article may still double as a useful reminder to multiple stakeholders to prevent "party-waiting-for-another-party" delays. I'll need Tylenol or an Aspirin for this headache. Overhead view. Either an overheadache or a good challenge! The Metrolinx-built spur extension will need to go under city-owned road overpasses, skim near the old LIUNA station, and then reconnect via a new CN-signaled crossover to the CN mainline near or past the old LIUNA station. Is this infrastructure really going to happen? However, it is important to note that this is in regards to infrastructure work, and not a definitive confirmation of the Niagara train stopping in 2016. When can this be completed? It's possible as early as 2016. However, West Harbour GO station has multiple construction phases lasting through 2017. Construction delays and crew scheduling lead time potentially mean Niagara timetables won't show Hamilton until 2018. This results in a probable date range of 2016-2018. Improving local goodwill is very important for a new Metrolinx project, the upcoming Hamilton LRT. Approximate calculations of operating costs (seen later in this article) indicates West Harbour GO could operationally break even (and becomes profitable) after a mere three new Hamilton passengers per train. This could reduce taxpayer costs of running the Niagara GO train route and contribute to continued GO expansion. Thus, completing this by 2016 could reduce taxpayer costs and benefit local goodwill. Can the existing Niagara trains stop in Hamilton by 2016? Stopping the Niagara GO trains in Hamilton should be a complete no-brainer. For this to happen by 2016, it is extremely critical that the right people at Metrolinx, at CN, and at City of Hamilton aren't left waiting for each other on a critical 100-meter piece of railroad. For example, is CN waiting for City of Hamilton to finish storm drain work? Is Metrolinx waiting for CN? Do we need to involve LIUNA Station? Etc. Any work that needs to be completed (e.g. storm drain adjustments), before the ground freezes, may need to be completed this fall where possible. Construction scheduling/ staging, resource allocation, pre-requisites, crew scheduling, should all be verified by all stakeholders to allow this happen by 2016. These diagrams illustrate a possible solution for the West Harbour GO dead-end track. This can be completed far before the Stoney Creek GO extension. The below diagrams illustrates an alternative solution, if it is not practical to install a switch track between James Street North and John Street North. Metrolinx sometimes uses longer, higher speed rail switches, even on tracks with low-speed limits. This may not necessarily fit between James Street and John Street overpasses, as there are overpass pillars in the way of a diagonal 'switch' track. The next overpass east of John Street (pedestrian bridge) has no pillar, permitting a longer switch. What is the length of a railroad switch? This diagram illustrates a typical low-speed track switch, which is approximately three railroad cars long. A switch, similar to this one, will easily fit between the James Street North and the John Street North overpasses. This type of lower-speed switch (or slightly faster and longer) is probably all that is needed for a station that's inside a permanent low speed limit due to the nearby Lake Ontario curve. In the railroading world, this is also called a Permanent Slow Order (PSO). Many Hamiltonians like the Hamilton 16 Express GO bus because it is fairly quick. However, the Niagara GO train is more express than the weekday express commuter trains. The Niagara trains go from Union-Burlington in only 40 minutes, and coast past Hamilton's West Harbour GO in only 55 minutes after Union. Taking only 55 minutes West Harbour to Union, this is very competitive the Hamilton 16 Express GO bus while providing a more comfortable ride. In fact, the train can be faster during heavy long-weekend or event traffic. The Niagara trains run in both directions, so Hamiltonians can also visit Niagara Falls too as well, not just Toronto. This is a fairly quick 1-hour trip, faster than by bus to Niagara Falls today. The West Harbour stop would add only two minutes to an existing two hour train. This length is observed when GO adds extra stops to existing GO lines (e.g. Bloor station). However, other efficiencies will occur, that could erase this stopping delay completely. The Niagara train already runs extremely slowly next to West Harbour GO due to speed limits from the nearby CN railyard and Lake Ontario curve. This will make West Harbour a quicker-than-average stop, with minimal braking and acceleration time needed. West Harbour GO could also double as a siding track, picking up Hamilton passengers while simultaneously waiting for a freight train to pass. This could decrease freight contention. This is better than having the train waste time stopped between stations. This often happens, to let freight trains pass. Instead, the GO train is productively picking up new revenue passengers, while CN is productively passing the station toward the railyard or Hamilton/Bayview Junction. CN even benefits too, so they also would want to expedite this work too. With less waiting for trains to pass each other, Niagara seasonal service may actually speed up on average, cancelling-out the two minute stopping time on a two hour route. In the future, the funding for Stoney Creek GO (near Centennial Parkway for 2019) includes extra GO track infrastructure. This will speed up GO service further, and will likely far more than compensate for stopping at West Harbour GO. Typically, Niagara GO trains only last until the beginning of September, with the exception of the Thanksgiving weekend. However, for 2016 and beyond, the Niagara GO train service should be extended all the way to Thanksgiving to accommodate many events that occur between Labour Day and Thanksgiving. This allows the trains to double as James Street Supercrawl trains for outside visitors to Hamilton, and double as Nuit Blanche trains for Hamiltonians and other Golden Horseshoe residents. There are already late departure times on Niagara GO trains, which can serve Nuit Blanche well! Imagine inviting residents from Niagara and Toronto to come to Hamilton for Supercrawl, with all-day two-way weekend GO service. And Hamiltonians would easily be able to visit various big weekend events all along the shore of Lake Ontario. This would be spectacular. But what about year-round? And weekdays? It is anticipated that this could eventually happen. The question is when. For more information about issues currently preventing all-day two-way service, see Part 1 of this GO Series. In short, freight trains and the Welland canal drawbridge will often delay GO trains. Delayed trains are late for the remainder of the Lakeshore stations nearer Toronto. This also can cascade severely into delaying multiple commuter trains. The train schedule is less critical for weekend excursion trains, than for weekday commuter trains. It is better to initially begin expanding the Niagara seasonal GO train service to a year-round weekend service, before introducing all-week service for the Niagara route. Niagara Seasonal GO trains also have a bicycle coach. Imagine easily riding your bike down the new Hamilton bike infrastructure (e.g. Cannon bike lane) to West Harbour GO, and then bringing your bike to either Toronto or Niagara for a day trip. The Niagara train is an existing train, with an existing crew, that passes a brand new GO station in Hamilton, a major city along the Niagara GO corridor. The train also goes slow due to the speed limit near the Lake Ontario curve and the rail yard. Thus, the cost of the added stop will be very low. Assuming crew time of $100/hour total, we conservatively assume $4. This assumes the stop takes any extra crew time at all, considering the long dwell at Niagara Falls. Assuming a conservative three gallons/minute fuel (older FP40 locomotive), we assume $20 at typical government diesel prices. Assuming 1 staff for the station (wicket/security), average 16 hours of staffing per day for eight trains (4 per direction), $15/hr represents about $30 of staffing cost per train. At an average of $11 fare per Hamilton passenger going to either Toronto or Niagara Falls, a mere three extra passengers per train ($33) would make an unmanned West Harbour stop profitable! If the station is staffed by 1 person, we still only need 5 extra Hamilton passengers to be profitable. Due to the number of Hamilton residents observed using Aldershot GO even on weekends, Hamilton demand for weekend trains appears far higher than three passengers needed to break-even, likely in the region of an order of magnitude (e.g. about 30 passengers per train instead of 3). Given this observation, even any major error in my approximate amateur numbers above should still be insignificant. For Metrolinx, demand for incoming event trains (e.g. Pan Am trains) is unrelated to Hamiltonians wanting outgoing access to Toronto by GO train. Any possible poor demand (if any) for extra event trains should not affect the business case of expediting a West Harbour GO stop for an existing train. Even with the very incomplete and rough approximate numbers above, the business case appears to be justified for the West Harbour stop. Construction staging and inter-agency communications need to be optimized and expedited for this to happen on time for spring 2016 or for Supercrawl 2016 at latest, rather than 2017 or 2018. It will immediately begin providing taxpayer return sooner, and also immediately benefit Hamiltonians. For years, Niagara Falls has been clamoring for year-round GO service. One popular idea is the Niagara Express concept. In this scenario, two different GO train routes (Niagara-Hamilton and Hamilton-Toronto) do connecting service at an interchange station in or near Hamilton. Building a tunnel under Welland Canal, to avoid drawbridge delays, has been reported to cost almost a billion dollars. Just to avoid unexpected delays for Lakeshore West commuter service! Instead, connecting service is run instead. 15-minute electrified RER service would provide a short wait for connecting service between the Niagara Express and the Toronto train. Later, RER service could be extended from Burlington to Hamilton West Harbour GO (as part of a Phase two of RER, after initial electrification to Burlington). At this stage, Hamilton could become a major transfer between Niagara trains and Toronto trains, at a cost far lower than $1 billion. This includes the cost of extra infrastructure (including a rail-to-rail grade separation) between Burlington and Hamilton, with parallel GO tracks for full separation from freight tracks. This could permit 15-minute RER service to West Harbour GO, for any RER Phase two after the current 10-year plan. A special regular train between Niagara Falls and Hamilton would be provided, connecting to the RER service with a consistently short transfer wait regardless of delayed Niagara Express trains. Some of these transfer passengers could linger in Hamilton, boosting Hamilton's economy. Doing the Niagara Express idea could cost a lot less than a Welland Canal grade-separation, even when including a rail-to-rail grade separation between Aldershot and West Harbour necessary to achieve complete freight separation. This also assumes that West Harbour GO eventually gains the role as the all-day 15-minute GO station (instead of Hamilton downtown GO). The possible future role-switching of all-day service, between Downtown Hamilton GO and West Harbour GO, is already covered in GO Series Part 1. This can depend on the infrastructure evolution of both the GO network and the Hamilton LRT. Please note, however, this is a long-term vision among many possibilities. While actual Metrolinx plans for Niagara GO may differ, it is noteworthy that the Niagara Express idea was warmly received by Metrolinx. Hamilton is one of the biggest cities that the Niagara seasonal GO service passes through. Adding the West Harbour GO stop to this existing train should have immediate payback just a few extra passenger boardings per existing train. This already-funded project is potentially as small as a 100 meter track extension + switch, to turn West Harbour into a through station. While researching this article, I consulted many people in Hamilton over the last few weeks, including Ph.D. students, transit advocates, middle class residents, industry professionals, and a former train driver. They all came to a unanimous agreement on the economic case for the West Harbour GO stop. From our collective opinion and analysis, the priority of this extension needs to be raised to the highest possible priority among existing ongoing Hamilton GO construction projects. three different Hamilton GO construction sites were photographed in GO Series Part 1. Hamilton now has a beautiful new GO station that is now operational, yet only has two trains in the morning. All parties including Metrolinx, City of Hamilton, and CN, need to co-operate speedily as there are immediate benefits for everyone. Stopping the train at West Harbour GO reduces the taxpayer costs of the Niagara Seasonal Service & makes it more profitable. Extra revenue occurring sooner can be reinvested into continued expansion and reduce Ontario budget pressure. The ability to quickly and inexpensively introduce new Hamilton GO service will increase goodwill for the upcoming Hamilton LRT, another important local Metrolinx project. CN benefits by allowing GO trains to use West Harbour GO station as a siding/passing track, to easily allow freight trains to pass while GO picks up passengers. This improves operational flexibility and speed up GO service and freight service. It is in CN's interests to make this quickly happen, by coordinating quickly with Metrolinx and City of Hamilton. Hamilton residents gain the ability to travel to & from Toronto and Niagara Falls. The addition of many new fast trips in both directions is a big boon (including multiple destinations in between, including Burlington, St. Catharines, and others). This also becomes the fastest way to travel to Niagara Falls by public transit, as there is no speedy Niagara bus option for Hamilton. A great number of Hamiltonians have friends and/or family throughout the GTHA region. Also, tourists are increasingly interested in major Hamilton events such as Supercrawl, World Music Festival, and sports events including TiCats games. McMaster University students, who live outside of Hamilton, can commute more directly to Hamilton. Inexpensively introducing weekend GO service as quickly as 2016, would enhance Hamilton as a destination. Imagine parking for free at West Harbour GO (upon parking construction completion) and having a relaxing, quick train trip into Toronto. With so many amenities close to the Toronto and Niagara Falls stations, a train is often a fun and relaxing ride, especially for a family. One can also avoid parking stress during major downtown destinations, sports events & Exhibition events including the Ex. It's worth repeating: This is an existing GO train. Passing West Harbour GO. Without stopping. It is our collective opinion and analysis, that work must be prioritized among Metrolinx, CN and City of Hamilton to allow this train to stop at West Harbour during the 2016 season. The work is already funded. It provides immediate taxpayer return, raises goodwill, and benefits all parties. Let's do it ASAP. I work in the hospitality business in Niagara and I can tell you there are alot of people like myself commuting daily from Hamilton/Stoney Creek to the falls. This would help us tremendously. Get this opened ASAP. Give them a link to this article. Raise the awareness of the existence of this train. I also know of other Hamiltonians who are struggling to commute to Niagara Falls for work. I have personally several Toronto friends who want to visit us in Hamilton for a weekend, but have so much difficulty doing so conveniently. On many late Friday evenings (After 6:30) or Saturday mornings, sometimes there's a long wait for the Hamilton 16 Express Bus. So often, My Toronto friends have to take 4 or 5 transfers to visit me in Hamilton. Stopping the existing Niagara seasonal GO trains in Hamilton, will provide much more choice for Toronto friends/family visiting Hamiltonians for the weekend, save them over 30 minutes, while simultaneously eliminating one transfer. There is incredible demand, given that many Hamiltonians are from Toronto and have existing friends/family from Tdot. Mark, although the timing is still uncertain the John Street bridge is on deck for replacement in the near future. I don't know if it impacts your analysis or design suggestions, but it will be designed largely by CN with some input from the City ... and it may be replaced a la the Ferguson Bridge or reduced to a PED bridge like at Mary Street (there has been some chatter about the latter option, but I assume the default option is replacement to modern specs). Great article, btw. Very informative. Thanks for putting it together. The overpass rebuild should not necessarily be staged before the track. It's definitely a consideration for track alignment. In fact, the extension could possibly make the bridge rebuild and track logistics easier, by making it easier to shut down one track at a time, one after the other. In situations where one of the freight tracks is shut down, all Niagara trains could be detoured through the West Harbour GO spur extension. Good to know. Thanks for the extra insight. Glad to have someone really on top of this file. Great article, thank you. What we need to push the timeline forward is public pressure. Given the positive economics there is good reason to prioritize this project but only we, by joining our voices into one, will get it done! We need to do everything we can, that includes talking it up, amping it up, amongst ourselves, friends and politicians, getting out and showing support as needed etc! I'll be there will you? It is also noted that the spur extension would allow existing VIA and Amtrak trains (which also pass by) to stop at West Harbour GO. This should have been mentioned in this article, but it's worth pointing out. A link to this article apparently showed up in a daily email sent to Metrolinx employees as part of a regular email newsalert of all daily articles about GO/Metrolinx. Also, some city councillors has retweeted this article (Matthew Green and Aidan Johnson did), and I'm aware at least half of the city council has read this article. I'm no city planner, but I know that Metrolinx only does two GO timetables changes a year. A one-week delay can result in a train schedule change being delayed by six months. So expediency becomes a matter. Are you waiting for Metrolinx? Escalate. Is the storm drains in the railroad corridor, the responsibility of City of Hamilton? If so, can relocating these drains be expedited, say, a few weeks earlier, assuming it falls in the same-year budget anyway? Who manages the sewers/storm drains at City of Hamilton? Are they aware of the one in the way of the rail extension? What year budget does this fall in? Can storm drain work be re-staged at no cost? Is the railroad corridor storm drain CN responsibility, but needs downstream connection to the city system? Escalate. Are you waiting for anybody in City of Hamilton to complete work? Escalate. Are you waiting for CN to relocate equipment? Escalate. Convince them that the business case actually benefits them too (e.g. more efficient passing of trains). Is this on hold due to John St Overpass? The limit of two timetable changes a year (May & September) for GO Transit, is probably due to a union agreement for consistent crew scheduling. I'm not sure if adding a new stop on an existing train route, is included as an exception that can be done anytime. But it's a good reason why we need to make sure work isn't delayed because of the complex inter-agency co-operation. This is already funded infrastructure work. Let's make sure a one-week delay doesn't cause a timetable six-month missed-opportunity. Most of the point in his article is in the first two screenfuls. That's your "TL;DR"
He has over a thousand posts on UrbanToronto Transportation forums and has researched the Metrolinx PDF documents quite throughly. Also from what I read on @ham_lrt it appears Mark has already actually met with some city officials (along with a team of other LRT advocates). A little birdy told me that the whole works so to speak is being held up by CN right now! To answer the question, any new track layout from a GO Station perspective is actually designed by GO/Metrolinx itself and then sent to CN Track Infrastructure/Planning for approval. CN had a bad last quarter, and the next one doesn't look better. My guess is that, anything that GO wants will eventually be approved. Remember it is CN's track! They can take as long as they want. They may need GO Transit's track space leasing money however, any new track plan that affects their through running of freight trains can take no fewer than 8-12 months to negotiate, mainly due to engineer and conductor schedule positions. That line will require at least a #10-#12 diverging mainline turnout from the station track to the GO through running track. So if negotiations are not already happening, it will need to begin soon for any new changes for 2017 to be in place. However, it's wholly possible that the CN situation has changed. If it's CN holding things up, let's find a way to make it easier for CN. If this does not open sometime 2016, then the completed Lewis Layover facility (Photographed in Part 1) is dormant and useless for a period of time until the infrastructure is completed. Presumably, one hopes the negotiation started years ago, and that these are simply final negotiations, and we'll get passthrough capability 2016. One would hope. But this simple "100 meter extension" (or whatever existing plan approved) needs to be done expeditiously, for example - we don't want 2017 to turn into 2018. This article is also an Open Letter to CN, to City of Hamilton, to Metrolinx, and all parties. This reminds CN it's in their interest due to (1) goodwill with the City, and (2) it actually improves CN efficiency on Metrolinx's dime, and (3) they can give the go-ahead to elements (e.g. sewer work) long before details of the crossover is finished (e.g. scheduling). CN should, ideally let things get staged so certain construction elements happen expeditiously where it does not affect CN service. For example, CN can immediately permit City of Hamilton to do sewer relocation work immediately as it's not as complex as attaching a switch to a mainline. In that photograph, it looks possibly like sections of rectangular drainage conduit(? ), sitting on the LIUNA station foundation at the right edge of the photograph, waiting to be buried. Perhaps a construction laborour here can confirm whether it's storm drainage construction materials. This preliminary work can continue, even while all stakeholders are figuring out the final details about the railroad switch. Dangle any necessary carrot. Give CN some limited running rights through the station at nighttime, in exchange for expediting switch work. This provides a good detour (e.g. future CN track shutdown during bridge rebuild). That could allow things to happen quicker and without taxpayer dime, etc. City/Metrolinx employees -- any who are reading this -- if not sure, then find out what the holdup is, re-confirm, forward to someone responsible. And if you're one responsible for an element of the project (even the waterworks department) look at what can be done (e.g. splitting up a project so some essential tasks can be done sooner), so we don't miss a 6-month timetable window that could bump the service 2016->2017 or worse, 2017->2018. Currently, it is one of the biggest GO train capability improvements GO-network-wide, for almost the smallest possible infrastructure. Very, very low-lying apple except for the logistics and potential holdups. If the West Harbour switch work is staged simultaneously with the Lewis GO Facility, perhaps split them apart, and get the West Harbour switch work copmleted first. In exchange, give CN some limited running rights through the GO station (e.g. offpeak, nighttime, when the station is closed to public) so CN won't charge extra for expediting staging (sequence/scheduling of construction) of the "100 meter extension". I'm not sure if this is the right thing to do, or if it will speed things up at all, but it could possibly turn out to be a good quid pro quo. This could make track shutdowns easier (e.g. John Street bridge rebuild). Metrolinx and GO are provincial government agencies. Too bad that Hamilton Centre's MPP does not have the sort of clout that comes with being the leader of a major political party. It's in our interests, even as residents, to keep a good relationship with CN. 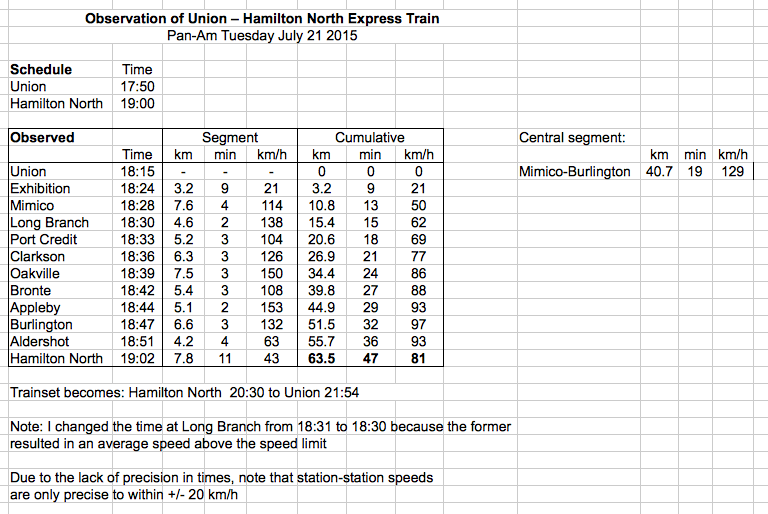 Without either CN/CP, there would be zero GO trains to Hamilton. Also, there is federal protection for mainline corridors as well. That said, clout is definitely important -- a letter from a leader can make a big impact. Mayor Fred wrote email to thank me for writing this article. I've replied politely suggesting writing a letter to CN/Metrolinx, reminding these parties of the importance of expediting this element. Even slightly. Due to this factor, this is a large impact from minor actions by everyone. GO-network-wide for the entirety of GTHA, several of us have researched, it's currently one of the biggest uncompleted upgrades to GO servicing capability for the smallest amount of work (albiet with very, very complex inter-agency co-ordination. Minor single-employee actions counts bigger than usual for this situation). Yes, it is a no-brainer. Do you think that the brainless powers-that-be will nix it, anyway? You're going to censor this one too, aren't you? "Yes, it is a no-brainer. Do you think that the brainless powers-that-be will nix it, anyway? " It is very easy to be skeptical; but I would like to say I have optimism here. My opinion is that the Niagara Stop is definitely going to happen. The question is when: 2016, 2017, 2018... This article, simultaneously doubling as an open letter, aims to try to bring the stop sooner. "You're going to censor this one too, aren't you?" It's a reader-operated mechanism. There's arrow buttons underneath your post. If enough confirmed registered readers click the "down" button, your post disappear. If this happened to your earlier posts -- then readers were probably clicking the downvote button on your post? Downvote buttons on posts. This causes the posts to fade slowly to grey until they disappear completely (when they get enough downvotes, with zero upvotes). It's not like the censorship system of another major newssite's comments section. It's not moderator-operated censorship. Instead, it's an audience-operated mechanism. Anonymous posts also seem to have a lower disappearance threshold. If a huge many readers downvotes your post, it fades to white and disappears. For that record, I have not clicked your downvote button. Your first line of text is useful to reply to (for the context of other readers) to as it is a common and understandable sentiment by some Hamilton residents. However, it would be appreciated that a little less resentment is in your posts. Negative sentiments needs to be nuanced as if you were talking to a family member, e.g. "In my opinion, I am dissapointed in..." instead of saying things "I ---- hate this city politicans, they never...". Such assertions are usually unhelpful and often invites a flurry of downvotes by other readers. Because it is other readers that votedown to cause posts to become lighter-and-lighter gray until they disappear to white. We're all in this together; as Hamiltonians. Let's work together! Although I dont agree with him (the author Mark) on everything, I have been paying attention to tweets by the @ham_lrt initiative. I must say I am impressed at the passion he has; along with a team of LRT advocates including Nicholas Kevlahan et cetra, Mark actually went out of his way to meet a few city officials in person over various public transit related topics. We need more active people in Hamilton like him. FWIW, most of the point of his article is all compressed into the first two screenfuls. That's your "TL;DR". His articles are really wordy, but are of extremely high quality. FWIW, 2015 was the sixth year of Niagara's seasonal summer service pilot and the province still doesn't see a business rationale for regular rail service in their ridership numbers. "Metrolinx spokesman Mark Ostler said 25,700 rode the rails between Niagara and Toronto during 12 weekends of service [ July/August/September], 1,049 less than the 26,749 during 12 weekends in 2014.... In 2012, 21,364 people rode the GO train during the seasonal service, while 21,406 did in 2013." Niagara service increases or not, whatever Niagara service continues still needs to include West Harbour GO as soon as possible. And later, that may defacto justify regular Niagara when accounting for increases of Hamiltonian boardings. With Metrolinx spending $50+ million on a relatively luxurious GO station in Hamilton (West Harbour GO). Let's admit it, as imperfect West Harbour GO is, as work slowly progresses towards 2017 completion -- West Harbour GO is apprently become among one of the best-looking GO stations on the entire GO network. West Harbour GO capex cost is relatively high at this moment, due to them rushing to open the station long before service was ready for it (only 2 trains per direction per day). A large utilization increase, already planned, is needed in the coming years. The goal is to do all the low lying apples as soon as possible to get relatively easy taxpayer returns on West Harbour GO sooner. Perhaps regular weekday service may not happen just yet. But it is one good next step towards justifying continued increases in Niagara GO trains. If you don't board a moving train, the seasonal service shaves about 8 minutes off the standard schedule: West Harbour to Union in 65 minutes instead of 73. It does vary some, due to freight considerations. This train was almost half an hour late in departing, at ~18:15. By 18:57, it was already entering West Harbour only 42 minutes later (see screenshot), creeping slowly for five minutes to finally stop at 19:02. That GO train took only 30 minutes from Union to Burlington. Without breaking the railroad speed limits. Whee! Also, there are some stations on the GO network that only adds 2 minutes extra to the GO train timetable (that's the Danforth station being added to the Stoufville line last year). West Harbour is an efficient stop due to the low rail speed limit due to the lake curve and freight yard, and should be an insignificant impact on a 2-hour trip. Also, I've seen GO trains regularly enter a station platform at over 70kph (according to my GPS speedometer) and stop by the end of the platform (300 meters); the darn weighty trains are really fast at braking. The Niagara trains are shorter/lighter, so they accelerate faster (more than 1kph/second) and they don't need to accelerate much in the West Harbour area due to the rail speed limit through Hamilton anyway... 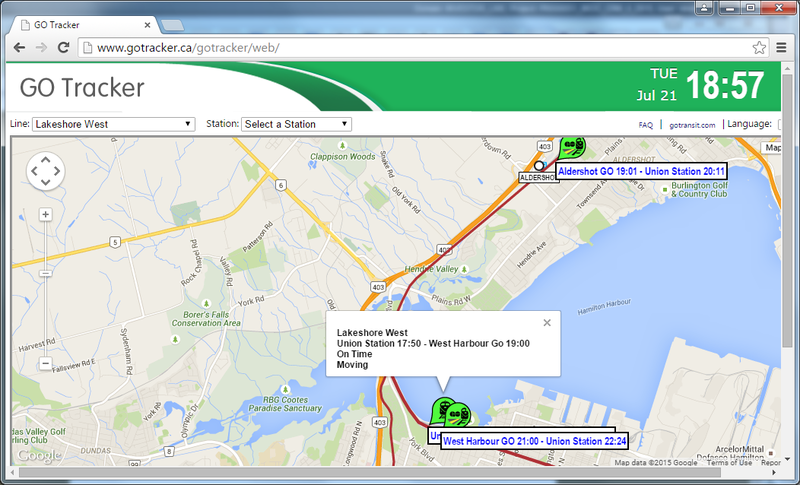 So West Harbour GO is a relatively efficient (schedule-wise) of a stop. The latest information I currently have is that West Harbour GO is going to go fully in service in late 2016. This means Niagara trains will be able to stop either later 2016 (on time for Supercrawl, if they extend the seasonal train season) or early 2017. Assuming no construction schedule delays. Not as early as I hoped, but very, very close to my predictions. Would a LRT type train service work between Niagara Falls and West Harbour GO (or somewhere else in Hamilton)?